PARIS — France launched air strikes Monday from its aircraft carrier in the Mediterranean as global efforts to combat the Daesh terror group gathered pace and world leaders met for talks on the Syrian crisis. British Prime Minister David Cameron said he would make his case to parliament on Thursday to join the coalition striking Daesh in Syria. That followed a morning meeting with President Francois Hollande during which he praised France's decision to ramp up strikes against the extremist group after the Paris attacks. "It's my firm conviction that Britain should do so too," Cameron said. 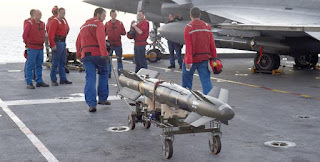 France bombed Daesh targets in Iraq on Monday, in the first sorties from the Charles de Gaulle aircraft carrier, newly deployed in the eastern Mediterranean. "We carried out strikes in Ramadi and Mosul in support of ground forces that were pushing against troops of [Daesh]," said army chief of staff General Pierre de Villiers, aboard the carrier. A week of frantic international diplomacy was under way with Hollande set to meet all five permanent members of the UN Security Council, and the United States trying to rally support for a ceasefire in Syria. Major differences remain over the future of Syrian President Bashar Assad. Western powers want him removed from power, but he retains strong support from old allies Russia and Iran. In his first visit to Iran for eight years, Russian President Vladimir Putin met with Iran’s supreme leader Ayatollah Ali Khamenei on Monday. They emphasised their opposition to any “external attempts” to bring regime change in Syria, a Kremlin official said. At the same time, US Secretary of State John Kerry was in Abu Dhabi hoping to forge a coalition of Syrian opposition groups for peace talks. Kerry hopes his Emirati and Saudi allies can pressure rebel factions into accepting a ceasefire with Assad within “a few weeks” — a step seen as crucial to refocusing the war on Daesh. “You can be confident that the diplomatic front is in high gear, with a very real plan on the table to be implemented,” Kerry said. In Paris, Cameron and Hollande stood side by side after laying a wreath at the Bataclan concert hall, where 90 of the 130 victims were killed in the Paris attacks of November 13. While Britain has joined US-led coalition strikes on Daesh in Iraq, it has so far held back from hitting targets in Syria, where the militants also hold large swathes of territory. The British leader said he had offered France the use of a strategically located British airbase in Cyprus, RAF Akrotiri, to facilitate air strikes, and assistance with refuelling French jets. Hollande, who has said France is in a “war” against the extremists, is embarking on what could be a defining week of his three-year-old presidency. On Tuesday, he will fly to Washington for talks with President Barack Obama, and will meet German Chancellor Angela Merkel and Italian Prime Minister Matteo Renzi in Paris over the next two days. Completing a series of meetings with each of France’s fellow UN Security Council members, Hollande will travel to Moscow for talks with Putin on Thursday and hold a working dinner with Chinese President Xi Jinping in Paris on Sunday. The Security Council on Friday authorised countries to “take all necessary measures” to fight Daesh in a resolution that won unanimous backing in the wake of the bloodshed in Paris. The measure drafted by France calls on all UN member states to “redouble and coordinate their efforts to prevent and suppress terrorist attacks” committed by Daesh and other extremist groups linked to Al Qaeda. Hollande said he hoped the resolution would “help mobilise nations to eliminate Daesh”. The US-led coalition has been pounding Daesh targets in Syria for over a year, but France joined the campaign only in September and has concentrated its air strikes on the extremists’ Syrian stronghold, Raqqa. Russia has also bombed Daesh targets but has attracted criticism from Western powers for bombing other rebel groups opposed to Assad, a long-time ally of Moscow. Iran has been Assad’s other main backer since an uprising broke out against his rule in 2011 and escalated into a brutal civil war.